Struggling Schalke are hoping Welsh teenager Rabbi Matondo can help turn their season around against Bayern Munich and his former club Manchester City in the coming weeks. Having finished second to Bayern in last season's Bundesliga under 33-year-old coach Domenico Tedesco, Schalke have lost ten of their 20 league games this term. Last weekend's 2-0 home defeat by Borussia Moenchengladbach left Schalke 12th in the table - still their highest position all season - as Matondo made his debut. He should feature again this Saturday at Bayern's Allianz Arena with Man City to come in the Champions League last-16 first leg at home on February 20. "He's 18 years old, we know that, but we've been watching him for so long. He already has the stuff to play in the Bundesliga," said Schalke director Christian Heidel. Schalke are winless in 17 games against Bayern, who they last beat in the 2011 German Cup semi-finals when Bayern's current captain Manuel Neuer was still at Schalke. Third-placed Bayern will be desperate to make amends for a shock 3-1 league defeat last Saturday at Bayer Leverkusen, who attacked mercilessly on the counter and found huge holes to exploit. Bayern bounced back with a 3-2 win at Hertha Berlin on Wednesday in the German Cup, but again proved shaky at the back with Mats Hummels making a bad mistake for Hertha's second goal before Kingsley Coman's winner. Schalke romped to a 4-1 Cup win at home to Fortuna Dusseldorf with Matondo showing glimpses of his talent in playing the first half only. After a raft of injuries up front, Schalke hope the signing of the Welsh youngster can rescue their season. The Cardiff-born teenager cost nine million euros ($10.275m) and arrived after breaking a club record in Manchester, clocking 2.62secs over 20 metres in sprint testing - the fastest of anyone at City. Schalke see Matondo as becoming their answer to Jadon Sancho - the 18-year-old England winger who has helped bitter rivals Dortmund go seven points clear in the league with consistently eye-catching performances. Tedesco sees him as a "medium and long-term" investment, who is "able to win every one-on-one". While Leroy Sane found success by going in the other direction from Schalke to Man City, Matondo is part of a trend of teens from top British clubs heading to the Bundesliga in search of game time. "Schalke is the right decision for my future as a footballer. 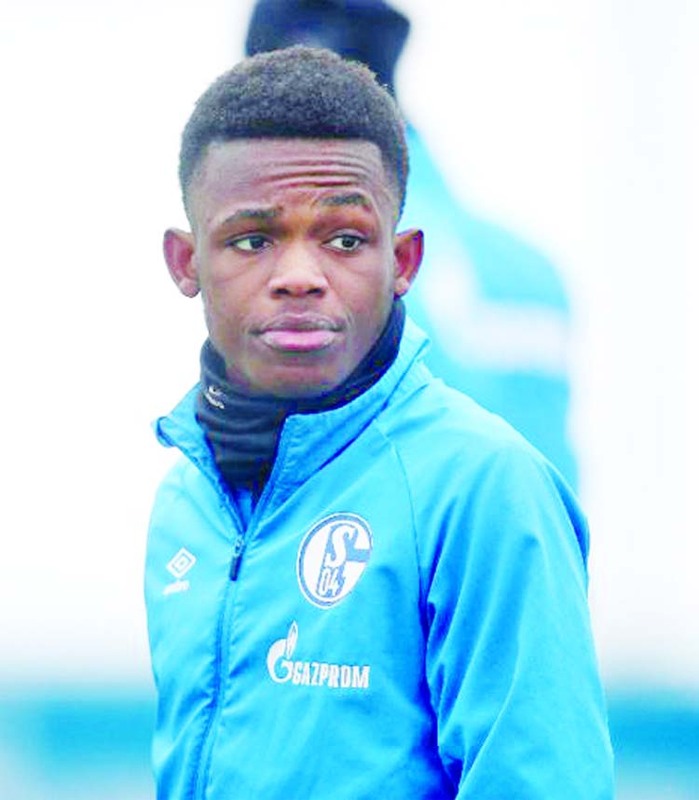 Guys like Mesut Ozil, Ivan Rakitic and Leroy Sane made huge strides in their career here," said Matondo on joining Schalke. Tedesco has shown a ruthless streak since taking over at Schalke in 2017, dropping club captain and 2014 World Cup winner Benedikt Hoewedes, who was loaned to Juventus before joining Lokomotiv Moscow. Current skipper and fan favourite Ralf Faehrmann, another product of the Schalke academy, was also ejected last month, replaced by Germany Under-21 goalkeeper Alexander Nuebel. Nuebel's sending off last Saturday saw Faehrmann reinstated for the mid-week Cup tie, but it remains to see who Tedesco will prefer in goal against Bayern.